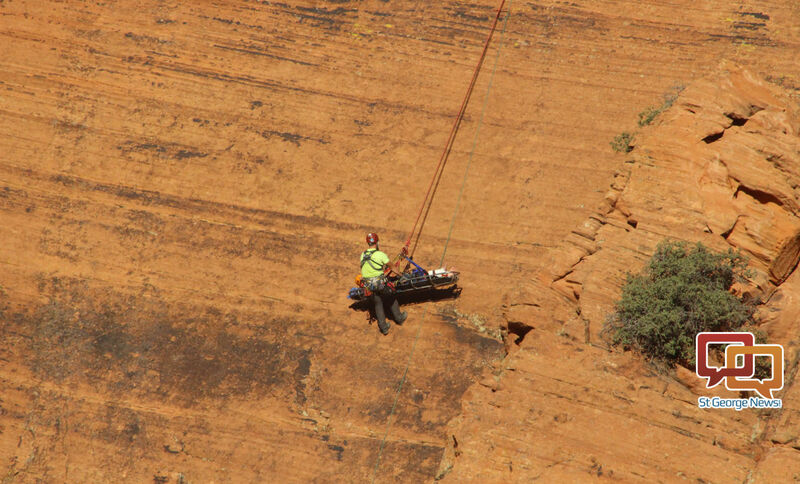 ST. GEORGE – A call to retrieve an injured mountain biker on the Wire Mesa Trail Tuesday afternoon marks the 80th response of the Washington County Sheriff’s Search and Rescue team since the start of the year. Around 1 p.m., county search and rescue team members were sent to Wire Mesa Trail near Grafton where a mountain biker had crashed and injured his hip, rendering him unable to walk, Washington County Sheriff’s Sgt. Darrell Cashin said. During a Washington County Commission meeting Tuesday, Cashin cited the incident as just 1 of 11 search and rescue calls the volunteer members of the county’s search and rescue team responded to between Sept. 20 and Oct. 17. Among the incidents he mentioned was another mountain biker who had crashed while on the Bear Claw Poppy Trail on Sept. 30 and had to be flown out by Intermountain Life Flight. Another incident occurred Oct. 7 and involved an ATV accident on Sand Mountain. The ATV driver sustained head injuries and was also flown to the hospital. Other calls involved lost hikers, as well as a rappelling accident Sunday and another ATV accident Monday, this time on the Arizona Strip. During the call Tuesday, just prior to the commission meeting, search and rescue personnel located the injured cyclist and hiked him out of the area until he was transferred to an off-road utility task vehicle. The UTV took the cyclist the rest of the way to a waiting ambulance that transported him to Dixie Regional Medical Center in St. George. Combined with the rest of the year’s calls, the Washington County Search and Rescue team has responded to 80 calls thus far in 2017, Cashin said. Washington County Commissioner Dean Cox, who has been involved with county search and rescue operations in the past, told Cashin that his team was on track to reach 100 calls for the year. It was something Cox said he previously experienced during his time with search and rescue. The Washington County Search and Rescue team responded to 111 calls in 2015. Increases in tourism and population, as well as periods of favorable weather, are among the reasons given for why search and rescue calls increase during certain times of the year. Thank you search and rescue! With more outdoor enthusiasts there will be more calls for help. Outdoor activities do come with risk. A huge SHOUT OUT to SAR. They get busier every year. Many are volunteers. We appreciate you! While we all appreciate the efforts of the S&R Teams who respond to these incidents, it still begs the question: “Who pays for the out-of-pocket costs of their services?”. If you look back over the past month or so, S&R Teams have been called out to a variety of incidents, including: lost hiker, mountain biking and canyoneering accidents. The funding sources to pay for these resources is not clear. The huge expense of using a helo for recovery could be the responsibility of the injured party, but even that is not clear. Most of us take personal responsibility for our actions, and carry insurance to protect us in the event of a catastrophic accident. If there is no financial consequence for someone who does something risky/stupid, then where is the disincentive?